Not sure about you, but there are many nights during the week that I have a small window to get dinner on the table. If you have not ever made sheet pan dinners, then you are missing out. Sheet pan dinner means you put your protein and side dish veggies on one sheet pan and it bakes together. This not only results in a quick meal but the clean up is a breeze. 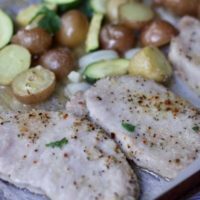 Pork chops are typically a quick meal solution but when you add potatoes and veggies all in the same pan, your dinner is not only fast but complete. 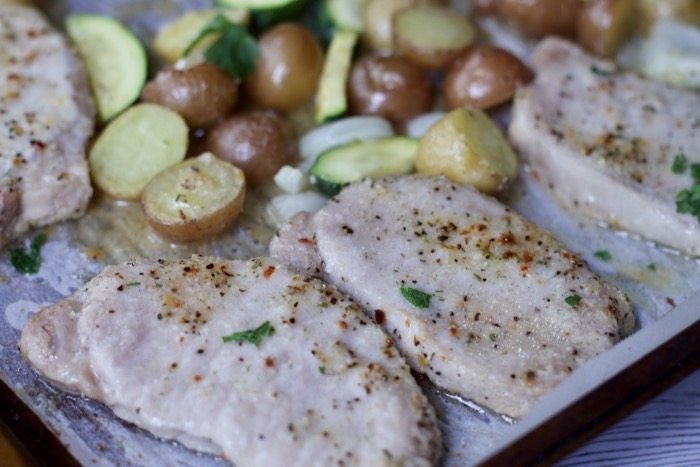 We used Smithfield All Natural Boneless Pork Chops and smothered them in a mixture of Italian Dressing seasoning and cheese, then surrounded them with baby potatoes, sliced zucchini, and onion for this new go-to Italian Pork Chop Sheet Pan Dinner Recipe. Everyone raved about them in my house, so these are definitely staying on our weeknight dinner rotation. 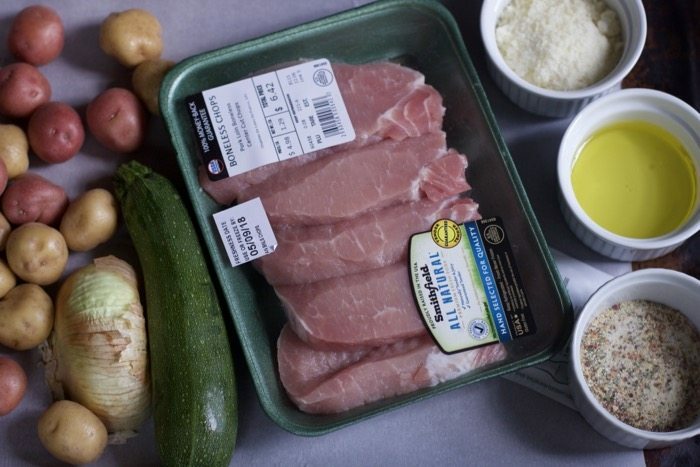 Simply mix the seasoning ingredients together and toss your pork chops. Add the veggies around the pork and season these as well. Sit back and get the kids to set the table. In less than 3o minutes in the oven, you have dinner on the table. Just look at all the juices on the pan. 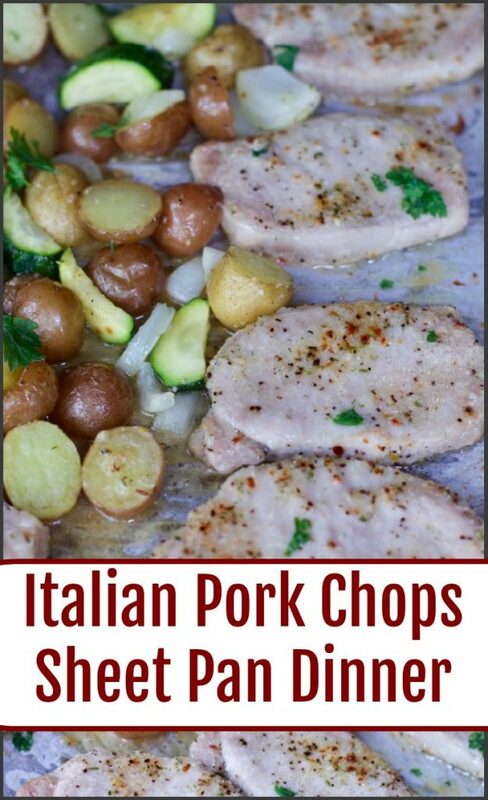 These pork chops are not just flavorful from all the yumminess we added but very moist. Just be sure not to overcook them as pork can get tough quickly. You can now find the NEW Smithfield All Natural Fresh Pork Guaranteed Tender at your local Walmart. Be sure to look for their new packaging. At Smithfield, they supply naturally tender and juicy fresh pork everyone can enjoy with no artificial ingredients, no preservatives, no added steroids or hormones. Helping everyone make smarter choices. You can taste the quality and difference. Don’t want to heat the kitchen this summer? Smithfield All Natural Fresh Pork is also Great on the Grill! Preheat oven to 400 degrees. Cover a Large Sheet pan with Parchment paper or spray with non-stick cooking spray. In a medium bowl, mix together 5 tablespoons olive oil, dressing mix packet, Parmesan cheese,and pepper. Dip each pork chop in the oil mixture, making sure to coat both sides, and place on the prepared pan. Repeat with remaining pork chops. Add the potatoes zucchini and onion to the sheet pan and drizzle 1 tablespoon olive oil over veggies Sprinkle with 1 tsp of sea salt and 1 tsp of parmesan cheese (optional). Toss lightly to mix together. Garnish with parsley and additional cheese on veggies if desired and serve. 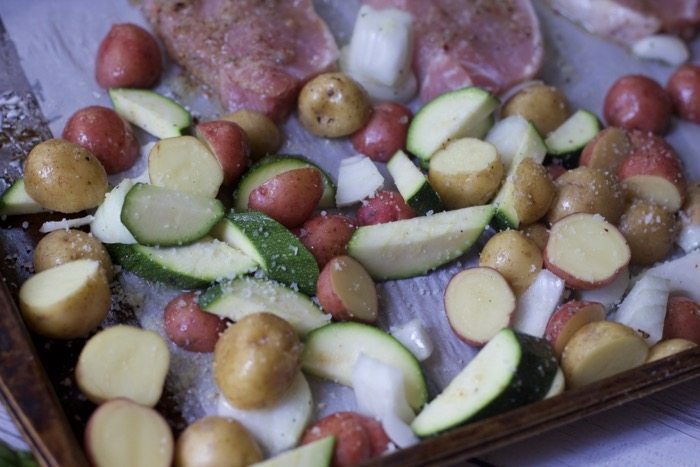 What is your favorite Pork and vegetable combination for this Sheet Pan Dinner? I hope he does, let me know if you change it up any. Sheet Pan dinners really make cooking for the family so much easier. You got me at pork chops! 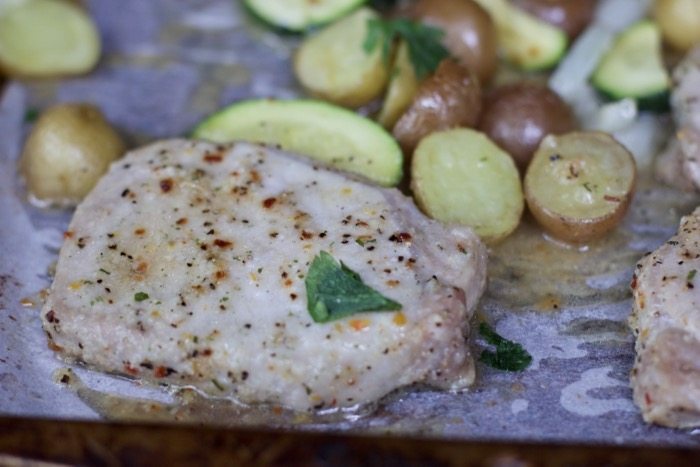 I love cooking on the oven using the sheet pan it is so easy and all food cooks perfectly. This dish I am sure I will be making very soon. My husband would totally love this for dinner! Thanks for sharing! Thank you Kristine. Perfect for a family of 5 or 2 as well. Our nights are so hectic that I am always looking for easy recipes that can feed my large family. I love how this one keep clean up to a minimum too. Good one! 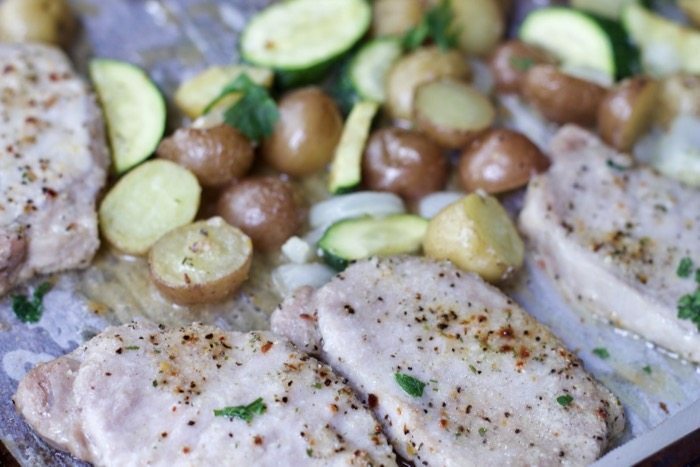 This sheet pan dinner looks delicious! Sheet pan meals are one of my favorites because they’re so easy and don’t make a giant mess. Pinning to try soon, thanks!